Launched worldwide across 2005–2006, the Xbox 360 was initially in short supply in many regions, including North America and Europe. The earliest versions of the console suffered from a high failure rate, indicated by the so-called "Red Ring of Death", necessitating an extension of the device's warranty period. Microsoft released two redesigned models of the console: the Xbox 360 S in 2010, and the Xbox 360 E in 2013. As of June 2014, 84 million Xbox 360 consoles have been sold worldwide, making it the seventh-highest-selling video game console in history, and the highest-selling console made by an American company. Although not the best-selling console of its generation, the Xbox 360 was deemed by TechRadar to be the most influential through its emphasis on digital media distribution and multiplayer gaming on Xbox Live. The Xbox 360's successor, the Xbox One, was released on November 22, 2013. On April 20, 2016, Microsoft announced that it would end the production of new Xbox 360 hardware, although the company will continue to support the platform. Known during development as Xbox Next, Xenon, Xbox 2, Xbox FS or NextBox, the Xbox 360 was conceived in early 2003. In February 2003, planning for the Xenon software platform began, and was headed by Microsoft's Vice President J Allard. That month, Microsoft held an event for 400 developers in Bellevue, Washington to recruit support for the system. Also that month, Peter Moore, former president of Sega of America, joined Microsoft. On August 12, 2003, ATI signed on to produce the graphic processing unit for the new console, a deal which was publicly announced two days later. Before the launch of the Xbox 360, several Alpha development kits were spotted using Apple's Power Mac G5 hardware. This was because the system's PowerPC 970 processor running the same PowerPC architecture that the Xbox 360 would eventually run under IBM's Xenon processor. The cores of the Xenon processor were developed using a slightly modified version of the PlayStation 3's Cell Processor PPE architecture. According to David Shippy and Mickie Phipps, the IBM employees were "hiding" their work from Sony and Toshiba, IBM's partners in developing the Cell Processor. Jeff Minter created the music visualization program Neon which is included with the Xbox 360. The Xbox 360 was released on November 22, 2005, in the United States and Canada; December 2, 2005, in Europe and December 10, 2005, in Japan. It was later launched in Mexico, Brazil, Chile, Colombia, Hong Kong, Singapore, South Korea, Taiwan, Australia, New Zealand, South Africa, India, and Russia. In its first year on the market, the system launched in 36 countries, more countries than any other console has launched in a single year. In 2009, IGN named the Xbox 360 the sixth-greatest video game console of all time, out of a field of 25. Although not the best-selling console of the seventh-generation, the Xbox 360 was deemed by TechRadar to be the most influential, by emphasizing digital media distribution and online gaming through Xbox Live, and by popularizing game achievement awards. 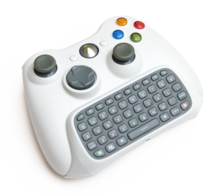 PC Magazine considered the Xbox 360 the prototype for online gaming as it "proved that online gaming communities could thrive in the console space". Five years after the Xbox 360's original debut, the well-received Kinect motion capture camera was released, which set the record of being the fastest selling consumer electronic device in history, and extended the life of the console. Edge ranked Xbox 360 the second-best console of the 1993–2013 period, stating "It had its own social network, cross-game chat, new indie games every week, and the best version of just about every multiformat game...Killzone is no Halo and nowadays Gran Turismo is no Forza, but it's not about the exclusives—there's nothing to trump Naughty Dog's PS3 output, after all. Rather, it's about the choices Microsoft made back in the original Xbox's lifetime. The PC-like architecture meant the early EA Sports games ran at 60fps compared to only 30 on PS3, Xbox Live meant every dedicated player had an existing friends list, and Halo meant Microsoft had the killer next-generation exclusive. And when developers demo games on PC now they do it with a 360 pad—another industry benchmark, and a critical one." The Xbox 360 began production only 69 days before launch, and Microsoft was not able to supply enough systems to meet initial consumer demand in Europe or North America, selling out completely upon release in all regions except in Japan. Forty thousand units were offered for sale on auction site eBay during the initial week of release, 10% of the total supply. By year's end, Microsoft had shipped 1.5 million units, including 900,000 in North America, 500,000 in Europe, and 100,000 in Japan. In May 2008 Microsoft announced that 10 million Xbox 360s had been sold and that it was the "first current generation gaming console" to surpass the 10 million figure in the US. In the US, the Xbox 360 was the leader in current-generation home console sales until June 2008, when it was surpassed by the Wii. The Xbox 360 has sold a total of 870,000 units in Canada as of August 1, 2008. Between January 2011 and October 2013, the Xbox 360 was the best-selling console in the United States for these 32 consecutive months. In Europe, the Xbox 360 has sold seven million units as of November 20, 2008, according to Microsoft. In the United Kingdom, the Xbox 360 has sold 3.9 million units as of June 27, 2009, according to GfK Chart-Track. While the original Xbox sold poorly in Japan, selling just 450,000 by November 2011, the Xbox 360 sold almost as poorly, selling 1.5 million units from 2005 to 2011. Edge magazine reported in August 2011 that initially lackluster and subsequently falling sales in Japan, where Microsoft had been unable to make serious inroads into the dominance of domestic rivals Sony and Nintendo, had led to retailers scaling down and in some cases discontinuing sales of the Xbox 360 completely. The significance of Japan's poor sales might be overstated in the media in comparison to overall international sales. The Xbox 360 sold much better than its predecessor, and although not the best-selling console of the seventh generation, it is regarded as a success since it strengthened Microsoft as a major force in the console market at the expense of well-established rivals. The inexpensive Nintendo Wii did sell the most console units but eventually saw a collapse of third-party software support in its later years, and it has been viewed by some as a fad since the succeeding Wii U had a poor debut in 2012. The PlayStation 3 struggled for a time due to being too expensive and initially lacking quality games, making it far less dominant than its predecessor, the PlayStation 2, and it took until late in the PlayStation 3's lifespan for its sales and games to reach parity with the Xbox 360. TechRadar proclaimed that "Xbox 360 passes the baton as the king of the hill – a position that puts all the more pressure on its successor, Xbox One". The Xbox 360's advantage over its competitors was due to the release of high-profile games from both first party and third party developers. The 2007 Game Critics Awards honored the platform with 38 nominations and 12 wins – more than any other platform. By March 2008, the Xbox 360 had reached a software attach rate of 7.5 games per console in the US; the rate was 7.0 in Europe, while its competitors were 3.8 (PS3) and 3.5 (Wii), according to Microsoft. At the 2008 Game Developers Conference, Microsoft announced that it expected over 1,000 games available for Xbox 360 by the end of the year. As well as enjoying exclusives such as additions to the Halo franchise and Gears of War, the Xbox 360 has managed to gain a simultaneous release of games that were initially planned to be PS3 exclusives, including Devil May Cry 4, Ace Combat 6, Virtua Fighter 5, Grand Theft Auto IV, Final Fantasy XIII, Tekken 6, Metal Gear Solid : Rising, and L.A. Noire. In addition, Xbox 360 versions of cross-platform games were generally considered superior to their PS3 counterparts in 2006 and 2007, due in part to the difficulties of programming for the PS3. TechRadar deemed the Xbox 360 as the most influential game system through its emphasis of digital media distribution, Xbox Live online gaming service, and game achievement feature. During the console's lifetime, the Xbox brand has grown from gaming-only to encompassing all multimedia, turning it into a hub for "living-room computing environment". Five years after the Xbox 360's original debut, the well-received Kinect motion capture camera was released, which became the fastest selling consumer electronic device in history, and extended the life of the console. Microsoft announced the Xbox One, successor to the Xbox 360, at E3 on June 10, 2013. Although succeeded as Microsoft's main console by the Xbox One, support from publishers for the Xbox 360 is expected to continue until at least 2016. On April 20, 2016, Microsoft announced the end of production of new Xbox 360 hardware; the company will continue to provide hardware and software support for the platform, as selected Xbox 360 games can be played on Xbox One. The Xbox 360 E model, announced at 2013's E3, shares many aesthetics with the Xbox One. The main unit of the Xbox 360 itself has slight double concavity in matte white or black. The official color of the white model is Arctic Chill. It features a port on the top when vertical (left side when horizontal) to which a custom-housed hard disk drive unit can be attached. On the Slim and E models, the hard drive bay is on the bottom when vertical (right side when horizontal) and requires the opening of a concealed door to access it. (This does not void the warranty.) 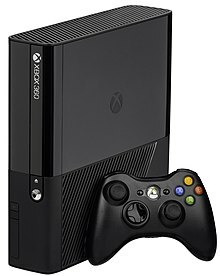 The Xbox 360 Slim/E hard drives are standard 2.5" SATA laptop drives, but have a custom enclosure and firmware so that the Xbox 360 can recognize it. Various hard disk drives have been produced, including options at 20, 60, 120, 250, or 320 GB. Inside, the Xbox 360 uses the triple-core IBM designed Xenon as its CPU, with each core capable of simultaneously processing two threads, and can therefore operate on up to six threads at once. Graphics processing is handled by the ATI Xenos, which has 10 MB of eDRAM. Its main memory pool is 512 MB in size. Many accessories are available for the console, including both wired and wireless controllers, faceplates for customization, headsets for chatting, a webcam for video chatting, dance mats and Gamercize for exercise, three sizes of memory units and five sizes of hard drives (20, 60, 120, 250 (initially Japan only, but later also available elsewhere) and 320 GB), among other items, all of which are styled to match the console. A Kinect sensor device. The Xbox 360 E revision has an additional Xbox logo to the left of the Xbox 360 branding. At launch, the Xbox 360 was available in two configurations: the "Xbox 360" package (unofficially known as the 20 GB Pro or Premium), priced at US$399 or GB£279.99, and the "Xbox 360 Core", priced at US$299 and GB£209.99. The original shipment of the Xbox 360 version included a cut-down version of the Media Remote as a promotion. The Elite package was launched later at US$479. The "Xbox 360 Core" was replaced by the "Xbox 360 Arcade" in October 2007 and a 60 GB version of the Xbox 360 Pro was released on August 1, 2008. The Pro package was discontinued and marked down to US$249 on August 28, 2009 to be sold until stock ran out, while the Elite was also marked down in price to US$299. Two major hardware revisions of the Xbox 360 have succeeded the original models; the Xbox 360 S (also referred to as the "Slim") replaced the original "Elite" and "Arcade" models in 2010. The S model carries a smaller, streamlined appearance with an angular case, and utilizes a redesigned motherboard designed to alleviate the hardware and overheating issues experienced by prior models. It also includes a proprietary port for use with the Kinect sensor. The Xbox 360 E, a further streamlined variation of the 360 S with a two-tone rectangular case inspired by Xbox One, was released in 2013. In addition to its revised aesthetics, the Xbox 360 E also has one fewer USB port, no AV connector (and thus is HDMI-only), and no longer supports S/PDIF. Discontinuation of all Xbox 360 models. The original model of the Xbox 360 has been subject to a number of technical problems. Since the console's release in 2005, users have reported concerns over its reliability and failure rate. To aid customers with defective consoles, Microsoft extended the Xbox 360's manufacturer's warranty to three years for hardware failure problems that generate a "General Hardware Failure" error report. A "General Hardware Failure" is recognized on all models released before the Xbox 360 S by three quadrants of the ring around the power button flashing red. This error is often known as the "Red Ring of Death". In April 2009 the warranty was extended to also cover failures related to the E74 error code. The warranty extension is not granted for any other types of failures that do not generate these specific error codes. Since these problems surfaced, Microsoft has attempted to modify the console to improve its reliability. Modifications include a reduction in the number, size, and placement of components, the addition of dabs of epoxy on the corners and edges of the CPU and GPU as glue to prevent movement relative to the board during heat expansion, and a second GPU heatsink to dissipate more heat. With the release of the redesigned Xbox 360 S, the warranty for the newer models does not include the three-year extended coverage for "General Hardware Failures". 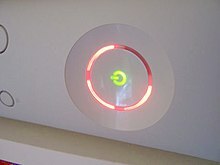 The newer Xbox 360 S and E models indicate system overheating when the console's power button begins to flash red, unlike previous models where the first and third quadrant of the ring would light up red around the power button if overheating occurred. The system will then warn the user of imminent system shutdown until the system has cooled, whereas a flashing power button that alternates between green and red is an indication of a "General Hardware Failure" unlike older models where three of the quadrants would light up red. The Xbox 360 launched with 14 games in North America and 13 in Europe. The console's best-selling game for 2005, Call of Duty 2, sold over a million copies. Five other games sold over a million copies in the console's first year on the market: Ghost Recon Advanced Warfighter, The Elder Scrolls IV: Oblivion, Dead or Alive 4, Saints Row, and Gears of War. Gears of War would become the best-selling game on the console with 3 million copies in 2006, before being surpassed in 2007 by Halo 3 with over 8 million copies. Six games were initially available in Japan, while eagerly anticipated games such as Dead or Alive 4 and Enchanted Arms were released in the weeks following the console's launch. Games targeted specifically for the region, such as Chromehounds, Ninety-Nine Nights, and Phantasy Star Universe, were also released in the console's first year. Microsoft also had the support of Japanese developer Mistwalker, founded by Final Fantasy creator Hironobu Sakaguchi. Mistwalker's first game, Blue Dragon, was released in 2006 and had a limited-edition bundle which sold out quickly with over 10,000 pre-orders. Blue Dragon is one of three Xbox 360 games to surpass 200,000 units in Japan, along with Tales of Vesperia and Star Ocean: The Last Hope. Mistwalker's second game, Lost Odyssey also sold over 100,000 copies. The 2007 Game Critics Awards honored the Xbox 360 platform with 38 Nominations and 11 Wins. Since the console's release, Microsoft has released several updates for the Dashboard software. These updates have included adding new features to the console, enhancing Xbox Live functionality and multimedia playback capabilities, adding compatibility for new accessories, and fixing bugs in the software. Such updates are mandatory for users wishing to use Xbox Live, as access to Xbox Live is disabled until the update is performed. At E3 2008, at Microsoft's Show, Microsoft's Aaron Greenberg and Marc Whitten announced the new Xbox 360 interface called the "New Xbox Experience" (NXE). The update was intended to ease console menu navigation. Its GUI uses the Twist UI, previously used in Windows Media Center and the Zune. Its new Xbox Guide retains all Dashboard functionality (including the Marketplace browser and disk ejection) and the original "Blade" interface (although the color scheme has been changed to match that of the NXE Dashboard). The NXE also provides many new features. Users can now install games from disc to the hard drive to play them with reduced load time and less disc drive noise, but each game's disc must remain in the system in order to run. A new, built-in Community system allows the creation of digitized Avatars that can be used for multiple activities, such as sharing photos or playing Arcade games like 1 vs. 100. The update was released on November 19, 2008. While previous system updates have been stored on internal memory, the NXE update was the first to require a storage device—at least a 128 MB memory card or a hard drive. Microsoft released a further update to the Xbox 360 Dashboard starting on December 6, 2011. It included a completely new user interface which utilizes Microsoft's Metro design language, and added new features such as cloud storage for game saves and profiles, live television, Bing voice search, access to YouTube videos and better support for Kinect voice commands. The Xbox 360 supports videos in Windows Media Video (WMV) format (including high-definition and PlaysForSure videos), as well as H.264 and MPEG-4 media. The December 2007 dashboard update added support for the playback of MPEG-4 ASP format videos. The console can also display pictures and perform slideshows of photo collections with various transition effects, and supports audio playback, with music player controls accessible through the Xbox 360 Guide button. Users may play back their own music while playing games or using the dashboard, and can play music with an interactive visual synthesizer. As of October 27, 2009, UK and Ireland users are also able to access live and on-demand streams of Sky television programming. At the 2007, 2008, and 2009 Consumer Electronics Shows, Microsoft had announced that IPTV services would soon be made available to use through the Xbox 360. In 2007, Microsoft chairman Bill Gates stated that IPTV on Xbox 360 was expected to be available to consumers by the holiday season, using the Microsoft TV IPTV Edition platform. In 2008, Gates and president of Entertainment & Devices Robbie Bach announced a partnership with BT in the United Kingdom, in which the BT Vision advanced TV service, using the newer Microsoft Mediaroom IPTV platform, would be accessible via Xbox 360, planned for the middle of the year. BT Vision's DVR-based features would not be available on Xbox 360 due to limited hard drive capacity. In 2010, while announcing version 2.0 of Microsoft Mediaroom, Microsoft CEO Steve Ballmer mentioned that AT&T's U-verse IPTV service would enable Xbox 360s to be used as set-top boxes later in the year. As of January 2010, IPTV on Xbox 360 has yet to be deployed beyond limited trials. In 2012, Microsoft released the Live Event Player, allowing for events such as video game shows, beauty pageants, award shows, concerts, news and sporting events to be streamed on the console via Xbox Live. The first live events streamed on Live were the 2012 Revolver Golden Gods, Microsoft's E3 2012 media briefing and the Miss Teen USA 2012 beauty pageant. XNA Community is a feature whereby Xbox 360 owners can receive community-created games, made with Microsoft XNA Game Studio, from the XNA Creators Club. The games are written, published, and distributed through a community managed portal. XNA Community provides a channel for digital videogame delivery over Xbox Live that can be free of royalties, publishers and licenses. XNA game sales, however, did not meet original expectations. though Xbox Live Indie Games (XBLIG) has had some "hits." When the Xbox 360 was released, Microsoft's online gaming service Xbox Live was shut down for 24 hours and underwent a major upgrade, adding a basic non-subscription service called Xbox Live Silver (later renamed Xbox Live Free) to its already established premium subscription-based service (which was renamed Gold). Xbox Live Free is included with all SKUs of the console. It allows users to create a user profile, join on message boards, and access Microsoft's Xbox Live Arcade and Marketplace and talk to other members. A Live Free account does not generally support multiplayer gaming; however, some games that have rather limited online functions already, (such as Viva Piñata) or games that feature their own subscription service (e.g. EA Sports games) can be played with a Free account. Xbox Live also supports voice the latter a feature possible with the Xbox Live Vision. Xbox Live Gold includes the same features as Free and includes integrated online game playing capabilities outside of third-party subscriptions. Microsoft has allowed previous Xbox Live subscribers to maintain their profile information, friends list, and games history when they make the transition to Xbox Live Gold. To transfer an Xbox Live account to the new system, users need to link a Windows Live ID to their gamertag on Xbox.com. When users add an Xbox Live enabled profile to their console, they are required to provide the console with their passport account information and the last four digits of their credit card number, which is used for verification purposes and billing. An Xbox Live Gold account has an annual cost of US$59.99, C$59.99, NZ$90.00, GB£39.99, or €59.99. On January 5, 2011, Xbox Live reached over 30 million subscribers. The Xbox Live Marketplace is a virtual market designed for the console that allows Xbox Live users to download purchased or promotional content. The service offers movie and game trailers, game demos, Xbox Live Arcade games and Xbox 360 Dashboard themes as well as add-on game content (items, costumes, levels etc.). These features are available to both Free and Gold members on Xbox Live. A hard drive or memory unit is required to store products purchased from Xbox Live Marketplace. In order to download priced content, users are required to purchase Microsoft Points for use as scrip; though some products (such as trailers and demos) are free to download. Microsoft Points can be obtained through prepaid cards in 1,600 and 4,000-point denominations. Microsoft Points can also be purchased through Xbox Live with a credit card in 500, 1,000, 2,000 and 5,000-point denominations. Users are able to view items available to download on the service through a PC via the Xbox Live Marketplace website. An estimated seventy percent of Xbox Live users have downloaded items from the Marketplace. Xbox Live Arcade is an online service operated by Microsoft that is used to distribute downloadable video games to Xbox and Xbox 360 owners. In addition to classic arcade games such as Ms. Pac-Man, the service offers some new original games like Assault Heroes. The Xbox Live Arcade also features games from other consoles, such as the PlayStation game Castlevania: Symphony of the Night and PC games such as Zuma. The service was first launched on November 3, 2004, using a DVD to load, and offered games for about US$5 to $15. Items are purchased using Microsoft Points, a proprietary currency used to reduce credit card transaction charges. On November 22, 2005, Xbox Live Arcade was re-launched with the release of the Xbox 360, in which it was now integrated with the Xbox 360's dashboard. The games are generally aimed toward more casual gamers; examples of the more popular games are Geometry Wars, Street Fighter II' Hyper Fighting, and Uno. On March 24, 2010, Microsoft introduced the Game Room to Xbox Live. Game Room is a gaming service for Xbox 360 and Microsoft Windows that lets players compete in classic arcade and console games in a virtual arcade. On November 6, 2006, Microsoft announced the Xbox Video Marketplace, an exclusive video store accessible through the console. Launched in the United States on November 22, 2006, the first anniversary of the Xbox 360's launch, the service allows users in the United States to download high-definition and standard-definition television shows and movies onto an Xbox 360 console for viewing. With the exception of short clips, content is not currently available for streaming, and must be downloaded. Movies are also available for rental. They expire in 14 days after download or at the end of the first 24 hours after the movie has begun playing, whichever comes first. Television episodes can be purchased to own, and are transferable to an unlimited number of consoles. Downloaded files use 5.1 surround audio and are encoded using VC-1 for video at 720p, with a bitrate of 6.8 Mbit/s. Television content is offered from MTV, VH1, Comedy Central, Turner Broadcasting, and CBS; and movie content is Warner Bros., Paramount, and Disney, along with other publishers. H.264 video support: Up to 15 Mbit/s, Baseline, Main, and High (up to level 4.1) Profiles with 2 channel AAC LC and Main Profiles. MPEG-4 Part 2 video support: Up to 8 Mbit/s, Simple Profile with 2 channel AAC LC and Main Profiles. As a late addition to the December Xbox 360 update, 25 movies were added to the European Xbox 360 video market place on the December 11, 2007 and cost 250 Microsoft points for the SD version on the movie and 380 points for the HD version of the movie. Xbox Live members in Canada featured the ability to go on the Xbox Live Marketplace also as of December 11, 2007 with around 30 movies to be downloaded for the same amount of Microsoft Points. On May 26, 2009, Microsoft announced it would release the Zune HD (in the fall of 2009), which was then the next addition to the Zune product range. This was of an impact on the Xbox Live Video Store as it was also announced that the Zune Video Marketplace and the Xbox Live Video Store will be merged to form the Zune Marketplace, which will be arriving on Xbox Live in 7 countries initially, the United Kingdom, the United States, France, Italy, Germany, Ireland and Spain. Further details were released at the Microsoft press conference at E3 2009. On October 16, 2012, Xbox Video and Xbox Music were released, replacing the Zune Marketplace. Xbox Video is a digital video service on that offers full HD movies and TV series for purchase or rental on Xbox 360, Windows 8, Windows RT PCs and tablets, and Windows Phones. On August 18, 2015, Microsoft rolled out an update renaming it Movies and TV similar to the Windows 10 App. Xbox Music provides 30 million music tracks available for purchase or access through subscription. It was announced at the Electronic Entertainment Expo 2012 and it integrates with Windows 8 and Windows Phone as well. In August 2015 Microsoft rolled out an update renaming it to Groove Music similar to the Windows 10 App. Xbox SmartGlass allows for integration between the Xbox 360 console and mobile devices such as tablets and smartphones. An app is available on Android, Windows Phone 8 and iOS. Users of the feature can view additional content to accompany the game they are playing, or the TV shows and movies they are watching. They can also use their mobile device as a remote to control the Xbox 360. The SmartGlass functionality can also be found in the Xbox 360's successor, the Xbox One. PartnerNet, the developers-only alternative Xbox Live network used by developers to beta test game content developed for Xbox Live Arcade, runs on Xbox 360 debug kits, which are used both by developers and by the gaming press. In a podcast released on February 12, 2007, a developer breached the PartnerNet non-disclosure agreement (NDA) by commenting that he had found a playable version of Alien Hominid and an unplayable version of Ikaruga on PartnerNet. A few video game journalists, misconstruing the breach of the NDA as an invalidation of the NDA, immediately began reporting on other games being tested via PartnerNet, including a remake of Jetpac. (Alien Hominid for the Xbox 360 was released on February 28 of that year, and Ikaruga was released over a year later on April 9, 2008. Jetpac was released for the Xbox 360 on March 28, 2007 as Jetpac Refuelled.) There have also been numerous video and screenshot leaks of game footage on PartnerNet, as well as a complete version of Sonic the Hedgehog 4: Episode I, which caused for the whole PartnerNet service to be shut down overnight on April 3, 2010. In the following days, Microsoft reminded developers and journalists that they were in breach of NDA by sharing information about PartnerNet content and asked websites to remove lists of games in development that were discovered on the service. Sega used feedback from fans about the leaked version of Sonic the Hedgehog 4: Episode I to refine it before they eventually released it. Additionally, a pair of hackers played their modded Halo 3 games on PartnerNet in addition to using PartnerNet to find unreleased and untested software. The hackers passed this information along to their friends before they were eventually caught by Bungie. Consequently, Bungie left a message for the hackers on PartnerNet which read "Winners Don't Break Into PartnerNet." Other games that were leaked in the PartnerNet fiasco include Shenmue and Shenmue 2. ^ Radd, David (August 16, 2005). "Xbox 360 Manufacturers Revealed". Bloomberg Businessweek. Archived from the original on August 17, 2010. Retrieved August 19, 2010. ^ Ashcraft, Brian (November 19, 2010). "Report: Foxconn Denies Protest Over Pay | Kotaku Australia". Kotaku.com.au. Retrieved October 23, 2011. ^ "New Xbox 360 model on sale now for £149 in the UK". ^ "E3 2013: New Xbox 360 Model Revealed". ^ a b Dybwad, Barb (September 15, 2005). "Xbox 360 launch date is November 22". Engadget. Retrieved March 14, 2013. ^ a b c "Achievement Unlocked: 10 Years – Thank You, Xbox 360". Xbox Wire. Retrieved January 22, 2017. ^ "E3 2014: $399 Xbox One Out Now, Xbox 360 Sales Rise to 84 million". GameSpot. Retrieved March 24, 2017. ^ "Xbox 360 Cloud Storage Size Revealed". Psu.com. Retrieved September 19, 2012. ^ "Google translation of Xbox.com/JA-JP". microsoft. Retrieved December 3, 2010. ^ Sam Byford (January 20, 2012). "Xbox 360 color space fix coming, still no word on restoring 1080p playback". The Verge. Retrieved September 19, 2012. ^ "Microsoft confirms Xbox 360 802.11n adapter". joystiq. September 21, 2009. Retrieved November 23, 2009. ^ Dean Takahashi (January 9, 2012). "Xbox 360 surpasses 66M sold and Kinect passes 18M units". VentureBeat. Retrieved January 10, 2012. ^ "Microsoft sells 24 million Kinects". Joystiq. ^ "Original Xbox Games Playable on Xbox 360". Archived from the original on May 12, 2008. Retrieved November 17, 2009. ^ Corriea, Alexa Ray (May 2, 2015). "Why Are Current Consoles Not Backward Compatible?". GameSpot. Retrieved April 11, 2018. ^ a b "The 10 Greatest Video Game Consoles of All Time". PC Magazine. ^ a b Ashlee Vance (January 13, 2012). "Steve Ballmer Reboots". Bloomberg.com. ^ a b Ross Miller (November 13, 2012). "Living with the Xbox 360: how Microsoft's trojan horse took over your living room". The Verge. Vox Media. ^ a b "Is the Xbox 360 the Elusive Living Room PC?". PC Magazine. Retrieved January 22, 2017. ^ a b c d e f Jon Hicks. "How the Xbox 360 won the console war". TechRadar. Retrieved January 22, 2017. ^ a b c Thorsen, Tor (June 14, 2010). "New $200 Xbox 360 planned, Elite & Arcade getting $50 price cut". GameSpot. CBS Interactive. Archived from the original on June 17, 2010. Retrieved June 17, 2010. Moore said that Microsoft is currently working on a second new Xbox 360, which will be offered at the arcade's price point of $200. He declined to say what functionalities the cheaper model would or would not have. [...] One likely scenario is the cheaper model will essentially be a slim arcade with no Wi-Fi capabilities or a hard drive. [...] Moore also said that going forward, all future models of the Xbox 360 would not have names and would only be designated by their memory capacity. ^ "E3 2013 Reveals New Xbox 360 Console Model And Introduces Free Games For Gold Members". The Inquisitr. June 10, 2013. Retrieved June 22, 2013. ^ a b Keith Noonan (January 3, 2014). "Has Microsoft Dodged Its Xbox One Disaster?". The Motley Fool. ^ "Microsoft unveils Xbox One next-generation console". BBC. May 21, 2013. Retrieved May 21, 2013. ^ Smith, David (June 2004). "Microsoft Narrowing Down Xbox Successor's Name?". Ziff Davis Media. Archived from the original on May 17, 2007. Retrieved July 26, 2008. ^ a b c Takahashi, Dean (May 1, 2006). "Chronology of Xbox History, 2003". Mercury News. Archived from the original on September 22, 2008. Retrieved November 2, 2006. ^ Becker, David (August 14, 2003). "ATI wins bid for next Xbox". CNET. Retrieved July 26, 2008. ^ Jonathan V. Last (December 30, 2008). "Playing the Fool". Wall Street Journal. ^ Stuart, Keith (July 5, 2005). "Jeff Minter vs Xbox 360: how Microsoft bought the light synth vision". The Guardian. London. ^ Perry, Douglass (October 17, 2006). "Microsoft Spreads 360 Love". IGN. Retrieved October 18, 2006. ^ "Xbox 360 is number 6". IGN. Retrieved November 11, 2010. ^ a b "Game Over: Fastest Selling Tech Device In History to End Console War". Yahoo Finance. November 14, 2013. ^ Edge Staff (September 20, 2013). "The ten best consoles: our countdown of the greatest gameboxes of the last 20 years". Edge Online. Archived from the original on March 25, 2014. Retrieved January 21, 2014. ^ a b Leigh Alexander (March 31, 2011). "GameStop Details Europe, U.S. Installed Base For Consoles". Gamasutra. Retrieved March 31, 2011. ^ a b "Xbox 360 set to surpass Nintendo Wii's UK sales record". TechRadar. February 14, 2013. Archived from the original on February 17, 2013. Retrieved February 21, 2013. ^ a b "Xbox 360 sells 1.5 million in Japan". Eurogamer. June 17, 2011. Retrieved June 17, 2011. ^ "This Is A Nice, Nice Xbox 360". Kotaku. April 19, 2010. Retrieved April 19, 2010. ^ Moriarty, Colin (October 17, 2013). "Xbox 360: 80 Million Sold and Counting". IGN. Retrieved November 4, 2013. ^ Morris, Chris (July 5, 2006). "Nintendo's Wii may get early launch". CNN Money. Retrieved March 23, 2009. ^ "Microsoft cooking 360 figures?". GameSpot. April 16, 2007. Archived from the original on January 11, 2010. Retrieved July 26, 2008. ^ "Shortages spoil Xbox 360 launch". BBC News. November 23, 2005. Retrieved December 31, 2009. ^ "Xbox 360 Launch Takes Europe by Storm". Archived from the original on August 10, 2007. ^ "Retailers Sell Out of Initial Xbox 360 Shipments". Archived from the original on January 6, 2008. Retrieved October 14, 2008. ^ "Xbox 360 sells out within hours". BBC. December 2, 2005. Retrieved July 26, 2008. ^ Svensson, Christian (December 2, 2005). "40,000 Xbox 360s Sold on eBay". Future Network USA. Archived from the original on July 1, 2011. Retrieved July 26, 2008. ^ "Microsoft FY2006 Quarter 2 report". Microsoft. January 26, 2006. Archived from the original (Powerpoint) on February 25, 2006. Retrieved July 26, 2008. ^ "Xbox 360 First to Reach Ten Million Console Sales in U.S." Microsoft. May 14, 2008. Archived from the original on May 17, 2008. Retrieved May 14, 2008. ^ Tom Magrino (July 17, 2008). "NPD: PS3 sales spike on MGS4". GameSpot. Archived from the original on October 13, 2008. Retrieved November 22, 2008. ^ Joe Keiser (July 17, 2008). "NPD: Wii Overtakes 360 in US". Edge. Archived from the original on August 15, 2011. Retrieved November 22, 2008. ^ Ryan Kim (July 17, 2008). "E3: Nintendo Wii pulls ahead of Xbox 360 in console sales". San Francisco Chronicle. Retrieved November 22, 2008. ^ Neil Davidson (August 26, 2008). "Nintendo Wii surpasses mark of one million consoles sold in Canada". The Canadian Press. Yahoo!. Archived from the original on September 16, 2009. Retrieved September 8, 2008. ^ Todd Bishop. "Xbox 360 vs. Wii vs. PS3: Who won the console wars?". GeekWire. Retrieved January 22, 2017. ^ Dan Howdle (November 13, 2009). "Xbox 360 European Sales Top 10m". Microsoft. Retrieved March 2, 2010. ^ "The Life and Death of the Original Xbox". IGN UK. Retrieved September 13, 2018. ^ Nathan Brown. "Xbox 360: dead in Japan? – Edge Magazine". Next-gen.biz. Archived from the original on August 24, 2011. Retrieved August 24, 2011. ^ Fahey, Rob. "Japan is just a symptom of Xbox' problems". GamesIndustry.biz. Retrieved June 23, 2018. ^ "What's wrong with Nintendo?". The Globe and Mail. Toronto. October 31, 2011. ^ Tassi, Paul (April 26, 2012). "Nintendo Reports $461.2M in Losses". Forbes. ^ Tassi, Paul. "Cardiac Arrests at Sony, Nintendo As Consoles Show Their Age". Forbes. Retrieved January 22, 2017. ^ rossmcguinness20 (November 27, 2013). "Xbox One v PlayStation 4: Who will win the next-gen console race? - Metro News". Metro. ^ "Nintendo Seen Missing Target as Sony-Microsoft Dwarf Wii U". Bloomberg. ^ Women. "Three Strategy Lessons From the Latest Round of Xbox vs. PlayStation". ^ Torrence Davis (April 17, 2008). "Xbox 360 Comes in 2nd For March Sales". The Bitbag. Archived from the original on April 20, 2008. Retrieved March 23, 2009. ^ "Official Press Release on DMC4 going Multiplatform". Capcom. March 20, 2007. Archived from the original on October 28, 2007. Retrieved October 25, 2007. ^ "Namco Bandai Games announces the worldwide launch of Ace Combat 6: fires of liberation for the Xbox 360". Namco Bandai. Archived from the original on October 11, 2007. Retrieved June 25, 2008. ^ McWhertor, Michael (December 21, 2006). "PS3 Loses Another Exclusive, Virtua Fighter 5 Comes to 360". Kotaku. Archived from the original on October 25, 2007. Retrieved October 25, 2007. ^ "Grand Theft Auto IV Comes to Xbox 360 on Day One". GameSpot. Archived from the original on December 2, 2008. Retrieved May 24, 2008. ^ Ramsay, Randolph (October 8, 2008). "TGS 2008: Tekken 6 smacking Xbox 360 – News at GameSpot". Gamespot.com. Archived from the original on July 10, 2011. Retrieved March 5, 2011. ^ Shah, Sarju (May 23, 2008). "Xbox 360 Versus PlayStation 3 Graphics Comparison: Round 3". GameSpot.com. Archived from the original on July 17, 2012. Retrieved July 19, 2012. ^ "Xbox 360 and PS3 support to continue until 2017 despite Xbox One and PS4 unveilings". trustedreviews.com. Retrieved August 24, 2013. ^ "Microsoft is stopping production of the Xbox 360". The Verge. Vox Media. Retrieved April 20, 2016. ^ "Install Your Own 120GB Xbox Drive, Save $100". Gizmodo. Gizmodo. Retrieved August 15, 2018. ^ "Xbox 360 HDD Replacement". IFixit. IFixit. Retrieved August 15, 2018. ^ "Xbox 360 Technical Specifications". Xbox.com. Archived from the original on August 22, 2008. Retrieved September 10, 2009. ^ "Xbox 360 Hard Drive accessory bumped to 250GB in Japan". Retrieved February 1, 2010. ^ "250GB Xbox 360 hard drive now available for $129.99". March 23, 2010. Retrieved March 23, 2010. ^ "MS unveils standalone 250GB HDD". Eurogamer. March 24, 2010. Retrieved March 25, 2010. ^ Scott Lowe (June 1, 2009). "E3 2009: Microsoft Unveils Motion Camera". IGN. Retrieved July 10, 2015. ^ "Xbox 360 Fat & Slim Comparison". Wireninja.com. June 21, 2010. Archived from the original on December 25, 2010. Retrieved January 31, 2013. ^ "Project Natal & Its Instruction Manual(!) In The Wild". Kotaku. April 20, 2010. Retrieved May 27, 2010. ^ Snider, Mike (June 14, 2010). "Microsoft Kinect gets into motion as E3 confab kicks off". USA Today. ^ "Microsoft Launches New Xbox 360 Console for Families". Microsoft. October 22, 2007. Archived from the original on October 23, 2007. Retrieved July 26, 2008. ^ "Microsoft drops price of 120 GB Xbox 360 system". USA Today. August 27, 2009. Retrieved September 10, 2009. ^ Patel, Nilay (June 14, 2010). "New Xbox 360 looks angular and Ominous". Engadget. Retrieved June 14, 2010. ^ Anand Lal Shimpi (June 18, 2010). "Welcome to Valhalla: Inside the New Xbox 360". AnandTech. Retrieved June 19, 2010. ^ "Redesigned Xbox 360 E teardown reveals it's a cost saver for Microsoft". Geek.com. Retrieved December 22, 2013. ^ "Xbox.com | Xbox News – Microsoft Unveils Xbox 360 Elite". Web.archive.org. Archived from the original on April 5, 2007. Retrieved November 11, 2010. ^ "Microsoft Lowers Xbox 360 Price". Microsoft Corporation. Archived from the original on August 20, 2007. Retrieved July 26, 2008. ^ "Xbox.com | Xbox News – New Xbox 360 Family Console Released". Web.archive.org. October 25, 2007. Archived from the original on October 25, 2007. Retrieved November 11, 2010. ^ a b "E3 2008: 60GB Xbox 360 official, 20GB discounted and discontinued". Archived from the original on January 23, 2013. ^ a b "Xbox News – Xbox 360 Invites Everyone to Play". Web.archive.org. September 5, 2008. Archived from the original on September 5, 2008. Retrieved August 24, 2011. ^ "Microsoft admit Xbox problems". BBC. July 6, 2007. Retrieved February 13, 2009. ^ "Rings of Red". GamesIndustry.biz. Retrieved July 26, 2008. ^ Philip Kollar (June 26, 2007). "A Tale of 11 Broken Xbox 360s". Ziff Davis Publishing Holdings Inc. Archived from the original on April 29, 2016. Retrieved July 26, 2008. ^ Microsoft (June 5, 2007). "Xbox 360 Warranty Coverage Expanded". Archived from the original on June 5, 2007. Retrieved July 26, 2008. ^ "Xbox 360 Warranty extended for E74". majornelson.com. Retrieved April 17, 2009. ^ "Inside the Xbox 360 Elite". The Llamma's Adventures. April 19, 2007. Archived from the original on March 16, 2008. Retrieved July 26, 2008. ^ XanTium (June 13, 2007). "New Pictures of 2nd GPU HeatSink on Xbox 360". Xbox-Scene. Archived from the original on July 18, 2008. Retrieved July 26, 2008. ^ Microsoft (July 23, 2010). "Flashing red light on the Xbox 360 S console power button". Microsoft. Archived from the original on March 18, 2011. Retrieved September 2, 2011. ^ Plunkett, Luke. "The New Xbox 360 Won't "Red Ring"". Kotaku. Retrieved November 1, 2010. ^ Snider, Mike (July 11, 2006). "WWII shows no battle fatigue". USA Today. Retrieved July 26, 2008. ^ "Ubisoft Entertainment Reports Revenue For Fiscal Year 2005–2006" (PDF). Ubisoft. April 27, 2006. Retrieved July 26, 2008. ^ Thorsen, Tor (April 10, 2006). "Oblivion enjoying epic sales". GameSpot News. GameSpot. Archived from the original on September 29, 2007. Retrieved July 26, 2008. ^ Calonne, Stéphane (July 11, 2006). "Dead or Alive 4 passe le million" (in French). JeuxFrance. Retrieved November 22, 2006. ^ Kris Graft (November 3, 2006). "Strong Quarter for THQ". Next-Gen.biz. Archived from the original on September 5, 2012. Retrieved July 26, 2008. ^ Berardini, César (November 21, 2006). "Gears of War Hits 1 Million Units Sold". TeamXbox. Archived from the original on July 6, 2008. Retrieved July 26, 2008. ^ Microsoft Games Studio (January 19, 2007). "Gears of War Juggernauts sells three million units". Xbox.com. Archived from the original on February 2, 2007. Retrieved March 19, 2008. ^ Brendan Sinclair (January 3, 2008). "MS: 17.7 million 360s sold". GameSpot. Archived from the original on December 10, 2008. Retrieved January 4, 2008. ^ "Dead or Alive 4 to miss Japanese 360 launch". GameSpot. November 28, 2005. Retrieved July 26, 2008. ^ Douglas J. Parry (June 27, 2006). "The Future of Japanese Gaming". IGN. Retrieved July 26, 2008. ^ Ashcraft, Brian (October 18, 2006). "Blue Dragon Sells Well in Japan". Kotaku. Archived from the original on October 13, 2008. Retrieved July 26, 2008. ^ "Microsoft Xbox 360 Japanese Ranking". Japan Game Charts. Archived from the original on March 18, 2008. Retrieved March 19, 2008. ^ "2007 Winners". GameCriticsAwards.com. Retrieved January 22, 2017. ^ "AKQA Designs Xbox 360 Game Interface". Adweek. Adweek. Retrieved August 18, 2018. ^ "Xbox 360's cluttered interface led to Microsoft starting from scratch with". Games Radar. Games Radar. Retrieved August 18, 2018. ^ Dan Ackerman (November 17, 2008). "Hands On with the New Xbox 360 Dashboard". CNET. Retrieved October 6, 2015. ^ "Xbox 360 system update gets its colors in order, makes it mandatory". Engadget. Engadget. Retrieved August 18, 2018. ^ "Mandatory Xbox 360 Update Breaks Some Consoles, Microsoft Claims 'Coincidence'". Consumerist. Consumerist. Retrieved August 18, 2018. ^ Sarju Shah (July 16, 2008). "E3 2008: New Xbox Experience Preview". GameSpot. Archived from the original on January 18, 2016. Retrieved July 10, 2015. ^ Tom Bramwell (October 9, 2008). "New Xbox Experience". Eurogamer. Retrieved October 14, 2008. ^ Tom Bramwell (October 13, 2008). "NXE Will Allow for Remote Downloads". Eurogamer. Retrieved July 11, 2015. ^ "The Future of TV Begins Now on Xbox 360". Archived from the original on December 6, 2011. Retrieved December 6, 2011. ^ "Microsoft's new Xbox 360 UI has Bing voice search across Hulu, Netflix, YouTube, and live TV – Engadget". Engadget. AOL. June 6, 2011. Retrieved October 22, 2011. ^ "Xbox Live Fall 2011 Dashboard update preview: Bing search, voice control, and a Metro overhaul – Engadget". Engadget. AOL. September 9, 2011. Retrieved October 22, 2011. ^ "Xbox 360 System Software – Fall Update Summary". Microsoft. November 30, 2007. Archived from the original on December 2, 2007. Retrieved July 26, 2008. ^ "Enjoy Windows Media Center on your Xbox 360". Microsoft. Archived from the original on December 23, 2007. Retrieved January 1, 2008. ^ "Windows Connect Now Technology". Microsoft. December 21, 2004. Archived from the original on July 24, 2008. Retrieved July 26, 2008. ^ Joystiq (July 27, 2007). "HD-Streaming: Guide For Streaming HD To The Xbox360". Retrieved July 26, 2008. ^ "Xbox 360 Sky Player". Web.archive.org. January 7, 2010. Archived from the original on January 7, 2010. Retrieved August 24, 2011. ^ "Xbox 360 to show Sky live and on-demand programming | Technology, Media & Telecommunications | Reuters". Reuters<!. May 28, 2009. Retrieved September 10, 2009. ^ "Microsoft Integrates IPTV Software Platform With Xbox 360, Creating All-in-One Digital Entertainment Device" (Press release). Microsoft. January 7, 2007. Archived from the original on February 8, 2007. Retrieved January 7, 2010. IPTV on Xbox 360 is expected to be available to consumers by holiday season 2007 and will be offered by providers that are deploying TV services over broadband networks based on the IPTV Edition software platform. ^ "BT and Microsoft Announce Partnership to Deliver Powerful, First-of-its-Kind Entertainment Experience to Consumers Through Xbox 360" (Press release). Microsoft. January 8, 2008. Archived from the original on January 8, 2008. Retrieved January 7, 2010. All BT broadband customers will have the unique opportunity to receive the best in high-definition gaming, television and movies through an Xbox 360 console, in a powerful, all-in-one entertainment experience. BT Vision, which is powered by the Microsoft Mediaroom Internet Protocol TV (IPTV) platform, plans to make this first-of-its-kind device and service offering available to customers in the middle of 2008. ^ "Xbox will host BT's TV service". BBC News. January 9, 2008. Retrieved January 22, 2008. ^ "Steve Ballmer and Robbie Bach Keynote: 2010 International Consumer Electronics Show". Microsoft. January 6, 2010. Archived from the original on January 14, 2010. Retrieved January 7, 2010. J.D. Power and Associates have recently rated AT&T Uverse TV the best-rated, highest-rated residential TV satisfaction in the United States Southern and Western Regions for the second year in a row. I'm happy to announce that later this year AT&T will also enable subscribers to U-Verse to enjoy that service on their Xbox 360 consoles. ^ McElroy, Griffin (March 30, 2009). "GamerBytes study shows disappointing sales for XNA Community Games". Joystiq.com. Retrieved September 10, 2009. ^ Kyle Orland. "Microsoft Renames Xbox Live Silver to 'Xbox Live Free'". Retrieved January 22, 2017. ^ Barker, Ben (September 19, 2005). "Xbox Live The Silver Age". Microsoft. Archived from the original on February 4, 2009. Retrieved September 30, 2006. ^ Gettys, Jim W. (September 17, 2005). "More than Games". Microsoft. Archived from the original on September 8, 2006. Retrieved September 30, 2006. ^ "Xbox Live Account Migration to Xbox 360". Microsoft. Archived from the original on October 24, 2008. Retrieved October 7, 2006. ^ "2010: A Year Filled with New Experiences for Consumers". Microsoft. January 5, 2011. Archived from the original on January 9, 2011. Retrieved January 11, 2011. ^ Gettys, Jim W. (August 19, 2005). "To Hard Drive or Not?". Microsoft. Archived from the original on April 27, 2007. Retrieved September 30, 2006. ^ Barker, Ben (September 20, 2005). "Xbox 360 Get the Points". Microsoft. Archived from the original on January 23, 2009. Retrieved September 30, 2006. ^ Berardini, César (October 12, 2006). "Browse Live Marketplace from your PC". TeamXbox. Archived from the original on February 10, 2007. Retrieved October 13, 2006. ^ Berardini, César (October 18, 2006). "Latest Xbox Live Facts and Stats". TeamXbox. Archived from the original on November 4, 2006. Retrieved October 19, 2006. ^ Morris, Chris (October 14, 2004). "Xbox Live Arcade to launch Nov. 3 – Oct. 14, 2004". CNN. Retrieved March 23, 2009. ^ Hryb, Larry (December 30, 2006). "Top Xbox Live Games of 2006". MajorNelson. Archived from the original on May 30, 2008. Retrieved July 26, 2008. ^ Fried, Ina (March 24, 2010). "Xbox Game Room launches, but with issues". CNET. Retrieved March 25, 2010. ^ Block, Ryan (November 7, 2006). "HDTV and HD movie downloads for your 360". Endaget. Retrieved November 11, 2006. ^ "Movies and TV on your Xbox" (Press release). Microsoft. November 6, 2006. Archived from the original on December 11, 2006. Retrieved July 26, 2008. ^ "Movies and TV on your Xbox 360 in Europe" (Press release). Microsoft. July 12, 2007. Archived from the original on June 20, 2008. Retrieved July 26, 2008. ^ Christopher Grant (December 11, 2007). "Xbox Live Video Marketplace Live in Canada, UK, and Elsewhere". Engadget. Retrieved October 9, 2015. ^ "Zune Marketplace" (Press release). Microsoft. May 27, 2009. Archived from the original on July 14, 2011. Retrieved May 27, 2009. ^ Brian Crecente (June 1, 2009). "Zune Video Comes to Live in 1080p HD This Fall". Kotaku. Retrieved October 9, 2015. ^ Tom Phillips (October 16, 2012). "Xbox 360 Dashboard Update Rolls Out from Today". Eurogamer. Retrieved July 11, 2015. ^ Andy Weir (August 18, 2015). "Microsoft Update Movies & TV and Groove Music Apps on Windows 10". Neowin. Retrieved October 9, 2015. ^ Wesley Yin-Poole (July 3, 2012). "Microsoft's iTunes, Spotify Rival Xbox Music Out This Year – Report". Eurogamer. Retrieved July 10, 2015. ^ "Microsoft aposenta aplicativo do Xbox 360 SmartGlass". Olhar Digital. Olhar Digital. Retrieved August 18, 2018. ^ "E3 2012: A closer look at Xbox SmartGlass". CNET. CNET. Retrieved August 18, 2018. ^ ludwigk. "Xbox 360 PartnerNet video hints at Jetpac, Juiced 2007 [update 1]". Retrieved December 30, 2016. ^ "The Sonic 4 "Leak Week," One Year On". Tssznews. Tssznews. Retrieved August 24, 2018. ^ "MICROSOFT INVESTIGATING HALO: REACH LEAK". IGN. IGN. Retrieved August 15, 2018. ^ "Yakuza 6's Demo Glitch is Another Mishap in Sega's History of Leaks". US Gamer. US Gamer. Retrieved August 15, 2018. ^ "THE YOUNG AND THE RECKLESS". Wired. Wired. Retrieved August 15, 2018. ^ "European retailers list Bayonetta, Vanquish and Shenmue releases for". VG 247. VG 247. Retrieved August 15, 2018. Wikimedia Commons has media related to Xbox 360.